It's the reddish one in the middle labelled "Fame Trend". Terrible name. They’re called Hot little Hands because I swear I thought the label on the yarn said “Flame” rather than “Fame”. Doh! 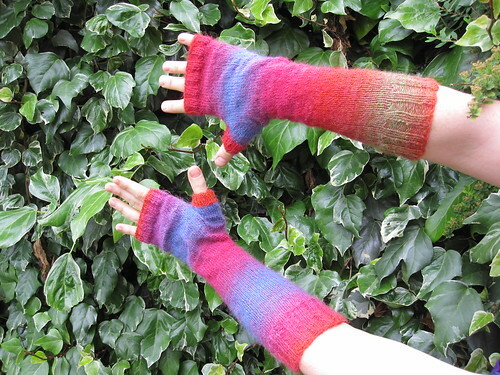 I turned the single ball into two pairs of mitts – one that comes almost up to the elbows, to avoid that unpleasant chill-up-your-coat-sleeves feeling, and a slightly shorter pair. I’ve still got a bit of it left, maybe enough for some socks for my little niece – talk about value for money! Any sock yarn will do. 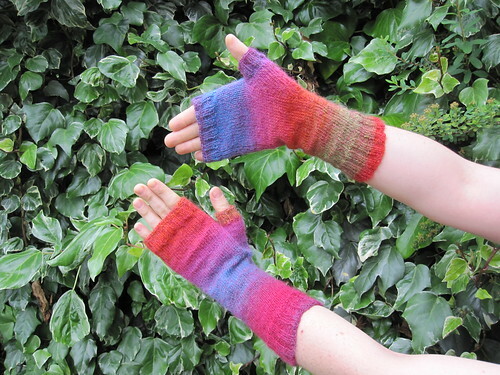 You’ll need roughly 50g per pair of mitts. 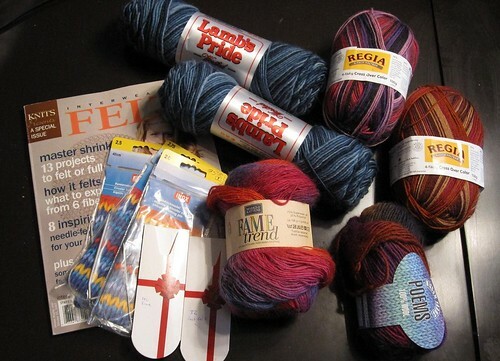 You will also need a set of 2.5mm double-pointed needles and a set of 2.75mm double-pooints. With 2.5mm double-pointed needles, cast on 52 stitches. Join in the round and work K2 P2 rib for 25 rounds (long version) or 20 rounds (short version). Switch to 2.75 mm needles. Knit 60 rounds (long version) or 25 rounds (short version). Start to make thumb gusset: Next round (thumb round 1) increase 1 by knitting into the front and back of each stitch (Kfb). Place a marker after these 2 stitches and continue to knit around. Knit 2 more rounds. Next round (thumb round 4), Kfb twice (ie into the 2 stitches before your marker – you should now have 4 stitches before the marker). Knit 2 rounds. Next round (thumb round 7), Kfb, K2, Kfb (you should now have 6 stitches before marker). Knit 2 rounds. Continue as established, knitting into the front and back of the first and last stitch of the marked section and knitting 2 rounds in between each increase round until you have 24 stitches in the marked section (75 stitches in total – 24 thumb stitches and 51 hand stitches). Once you have reached 24 stitches, knit 2 rounds after the increase round as per established pattern. Next round, slip these 24 thumb stitches onto some waste yarn and knit across the gap, pulling the yarn tightly to join between the end of the last round and the first stitch past the thumb. Knit 1 round. Next round, when you come to the “gap” where the thumb stitches are, pick up the small strand of yarn across the gap between the needles and knit into the back of it (i.e. twisting it to avoid making a hole), increasing 1 stitch and tightening up the inevitable slack yarn across the gap (total of 52 stitches in hand section). Switch to 2.5mm needles. K2P2 rib for 10 rounds. Cast off. For thumb, transfer thumb stitches onto 2.5mm double-pointed needles. Rejoin yarn and knit these stitches, picking up and knitting extra stitches as necessary in the gap to fill in where the thumb meets the hand. I usually pick up about 6 stitches here. Change K2P2 rib, decreasing where necessary to get down to 24 stitches. This takes a bit of figuring out – for example, if you’ve picked up 6 stitches, you’ll need to do something like K2tog, K2tog, P2tog, P2tog, K2tog, K2tog across the bit where the thumb meets the hand (6 stitches decreased). K2P2 for 8 rounds in total (including decrease round). Cast off. Weave in ends, tightening up any holes where the thumb meets the hand. Kat, one Christmas I was knitting mittens for myself, lovely purple-heather wool and a cabled pattern. My cousin was mixing White Russians and I just kept drinking and knitting until at one point I realised I’d knitted two perfectly-formed thumb gussets into one mitten. At that point, I just wearily closed my eyes. Nothing to do with the White Russians, I’m sure. Hahaha! oops… I’m sure I’ve made similar mistakes before. Drinking and knitting don’t mix, in my experience.